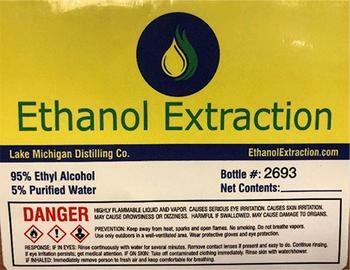 Lake Michigan Distilling Company of La Porte, Ind., doing business as Ethanol Extraction, is recalling its 95% Ethyl Alcohol product. The product may be contaminated with methanol, a highly toxic type of alcohol that can cause serious and sometimes fatal damage if ingested by humans or animals. A consumer in Massachusetts allegedly ingested the product and later died as a result. The recalled product, which is intended for use is as a solvent for extracting essential oils from plant material, was first sold in October 2016 and last sold on April 30, 2018 in various size plastic bottles, ranging from 8 oz. to 1 gallon, as well as 2.5-gallon and 5-gallon containers. Customers who purchased the recalled product should not drink or otherwise ingest it, but contact the company immediately to make arrangements for return shipment of the Product. Consumers may contact Dennis Zeedyk at Lake Michigan Distilling Company, LLC, 3522 SR104, LaPorte, Indiana 46350, or by phone at (219) 369‐1066, or fax (419) 715‐5070 from 9:00 a.m. – 3:30 p.m. (EST).